Just yesterday I had a little fun with my "Throwback Thursday" post, looking back at my past work. 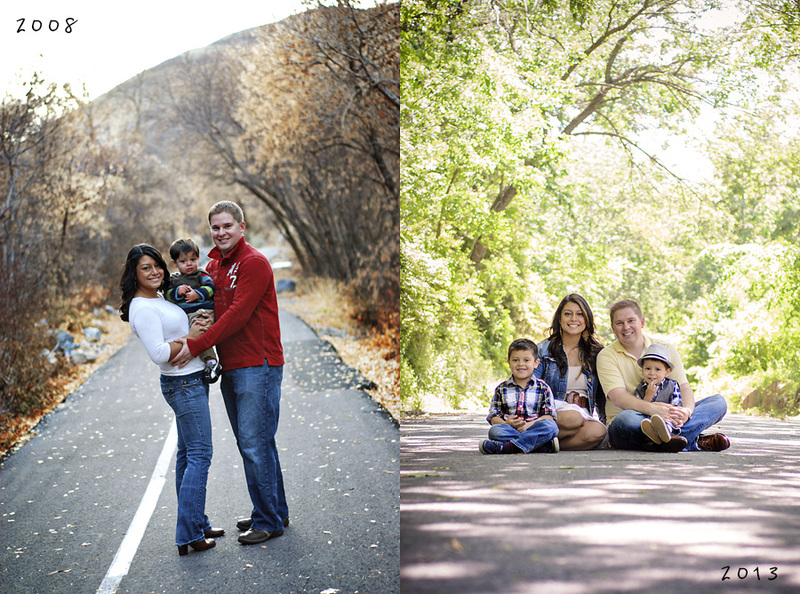 Tonight I spent my downtime after the kids were in bed editing a recent session with the Harmon family. A little back story: Martha and I went to high school together and eventually roomed together in college. Sharing clothes, late night gossiping in our beds, you name it. It was in college she met Josh, whom she later married. Well, years went by. I eventually met and married my husband Adam and bought my first SLR, a Nikon D80. Once I decided to "go for it" with photography (truly more of a hobby - I never expected to make any money or think I could turn it into a business) I needed to expand my portfolio. When it came to needing a family, I immediately thought of Martha and Josh. Not only were they good friends, but when you're 23/24, not many of your friends are a "family". The were the first people I called and they willingly accepted the task of being my guinea pigs. They were so supportive and appreciative of our session. Five years later, their support continues. A few weeks ago Martha contacted me about taking on their family once again, this time as a family of four. It was humbling and special for me to have things come full circle, to have come so far in these past 5 years. As an artist, I pick apart my work. I'm my own worst critic and a bit of a perfectionist. I'm always looking to improve. With my throwback post, you all were so kind and supportive when critiquing my old work. While I may be critical and see things with a different set of eyes, there was a constant between all the images I posted, old and new - each of those clients believed in me at the time, believe in me now, and have helped me grow with each session. For that, each image is always valuable and special.